. 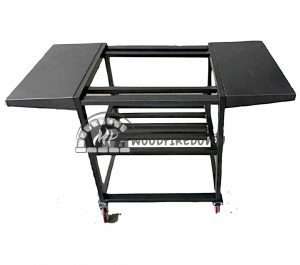 Maximus Trolley Stand New Design in powder coated steel. RED MAXIMUS WITH TROLLEY NOW ON SUPER SALE, ONLY WHILE STOCK LASTS PER DEPOT. 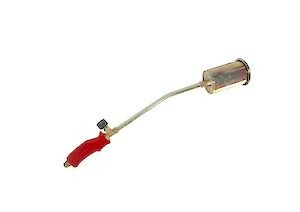 Available for pick up from Brisbane or Melbourne, can be shipped throughout Australia, ask us for a quote. 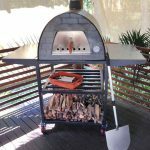 This Maximus wood fire pizza oven comes with a trolley stand for easy moving around the house, and is the best addition to your barbecue area, or for your balcony, verandah or backyard. 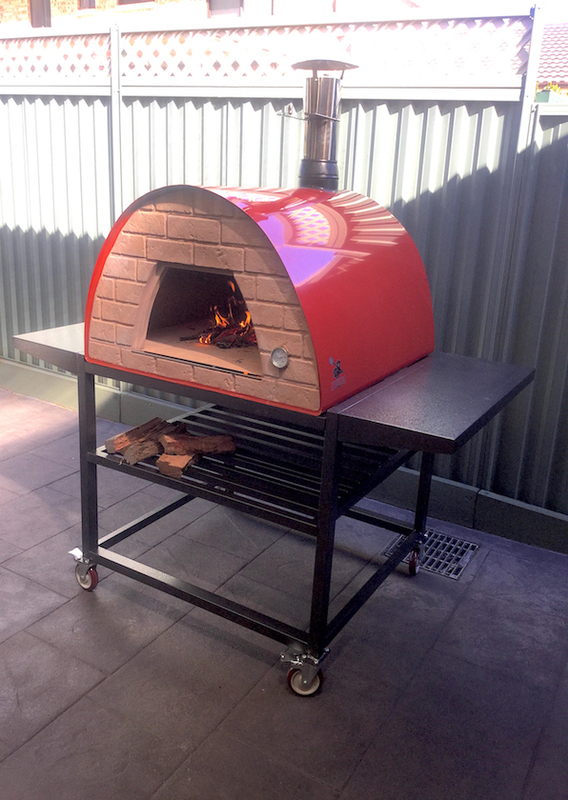 The Maximus is made of stainless steel and aluminium so that is a different concept from our brick dome wood fired ovens. 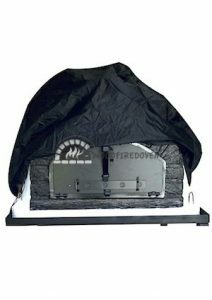 In a brick oven the bricks will absorb the heat first and once exhausted reflect it to the oven floor. This may take around 1 hour, whereas the Maximus will heat up in about 15 to 20 minutes only as only the floor bricks need heating up. 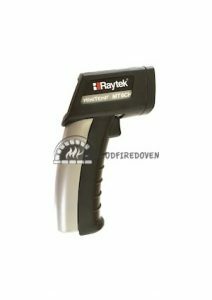 This means, comparing to the brick ovens, it won’t retain the heat for long once the fire is extinguished. 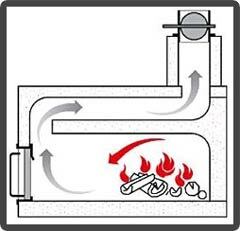 But it is very economical in the use of wood as it is well insulated, even under the oven floor, and it has a special stainless steel baffle inside which avoids that the heat goes straight out of the chimney like with likewise ovens. It only takes a tiny log of hardwood at the time to keep it going. 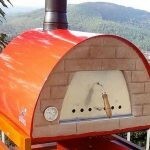 This pizza oven does the same job as the brick ovens: you can cook the perfect wood fired pizzas, lamb or pork roast, curry, roast potatoes and vegetables, beautiful homemade bread, and of course with that authentic wood fired flavour. 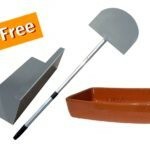 The trolley stand comes flat packed and is easy to assemble. 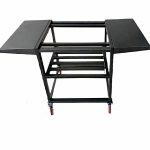 It has 2 removable side boards, a rack for wood storage underneath and 4 strong castor wheels. It is made of black powder coated steel. Available for pick up from our Melbourne (Maximus Red only) and Brisbane depots. Can be shipped around Australia, please ask us for the best shipping option to you. Thank you so much. It has been a pleasure dealing with you and I can’t wait to start making pizza! Gaat erg goed en we zijn vreselijk druk al met de catering. 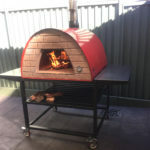 We are having great success with the pizza oven the Maximus both with pizzas and roasts and ribs. we use it once or twice most weeks. I love the Maximus oven, thank you. A very big thank you to you both. 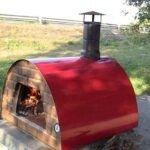 We received our pizza oven today. 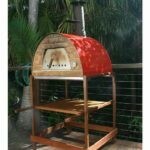 We appreciate your assistance and look forward to using our new pizza oven. Grazie tanto for the discount and clay pot. That was very kind of you. We will be in touch if we have any questions.